Anyone who has been around Juneau for long is sure to remember this past summer as one of the best ever. The sheer number of sunny days and the comfortable temperatures were a stark contrast to the typical climate, and many residents took advantage of the chances to get outdoors. After the time-change on Sunday, the official end of my workday has shifted to after sunset, making it more and more difficult to find opportunities to make new photographs. That is part of the reason that I was thinking back to the last trip Corey and I made out to the glacier together before summer ended. I was planning to share some of these photos in another venue, but time has not allowed it. 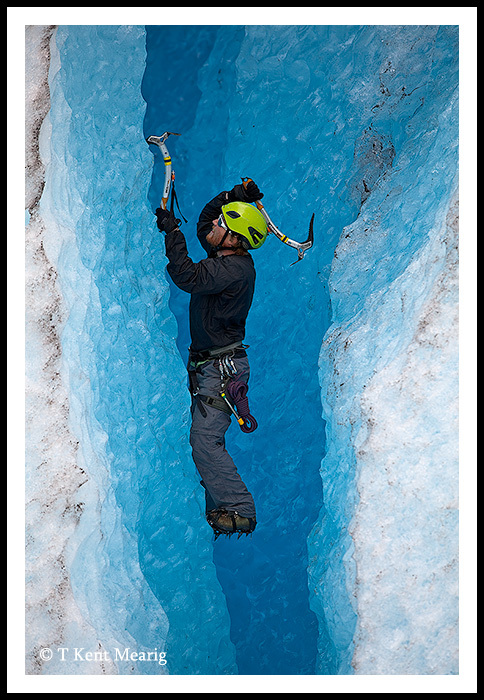 Every time I review them, I get a little excited (ice climbing is just so exhilarating), and I hope they do the same for you. 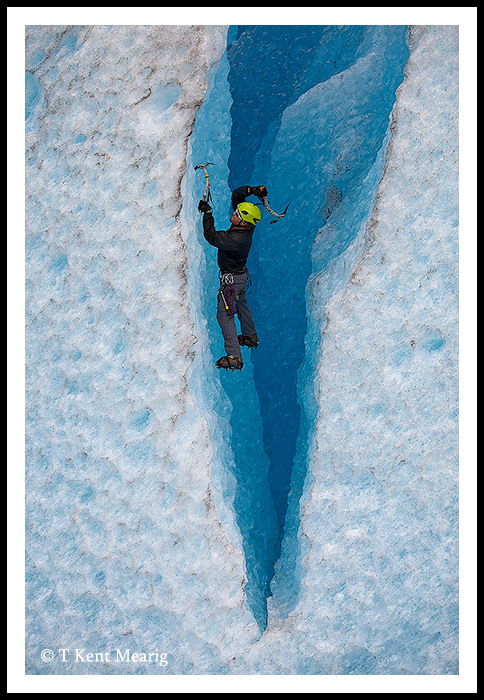 This first photo gives a unique perspective on crevasse climbing since it’s much more difficult to get a camera into position at climber level than it is to photograph from above. The image also showcases quite well the distinctive blue of deeper ice. The next photo betrays my location somewhat, showing that I was not down in the crevasse with Corey. 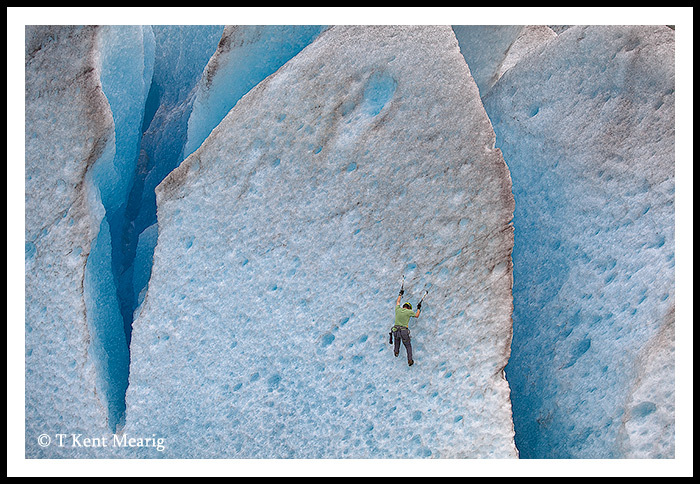 I was actually standing on the other side of a much larger crevasse and photographing with a telephoto lens to get the first image’s up-close perspective. I like this last one because it shows off the massive area in which Corey was climbing with no rope. I was more than just a little uneasy about it at the time, but he has just continued to shrug is off as no big deal whenever I’ve brought it up. It was an unbelievable summer. Hopefully next year it will at least be half as good. Already looking forward to getting out and playing on the glacier, ocean, and mountains. Thanks for posting some of these photos, it brings back some good memories.